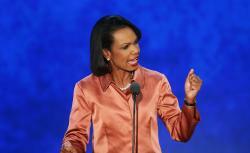 Condoleezza Rice's speech in Tampa pointed to problems but offered no solutions. Condoleezza Rice’s speech in Tampa pointed to problems but offered no solutions. Even after Condi, do we know anything about what a Romney foreign policy would look like? when one facing McCain and Giuliani in a Republican primary in the era of Bush would not risk otherwise. Then hawkishness had obvious policy ramifications, particularly support for continued commitments in Iraq.